Feel free to email us and ask any questions about the puppies. Let us know what color you are wanting, if you are wanting a male or female and the size that you are looking for. We will let you know what we have available, or what we may have comming in the future. We will ask questions of you, as we want to know your future plans for the puppy. Deposit and pickup payment information. We are now taking Paypal payments for deposits or payment and we can email an invoice directly to you on request where you can pay with a major credit card or debit card. You do not have to already have a paypal account to use the service. We prefer the US postal money orders purchased at the post office as payment or we ask for cash at pickup time for balances. Paypal payments will have a 4% charge added on as that is what the payment charge is with them. If you are getting a puppy from us, you will be asked to mail us a $200. non refundable deposit to hold the puppy. If it is less than 4 weeks of age we will ask you send us either a US postal money order purchased at the US post office, paypal payment or a personal check. If you the puppy buyer, cancel your purchase agreement with us the deposit of $200 is non refundable. Payment you have made over the $200. deposit will be refunded. If we cancel the sale to you then you will be refunded the deposit as well as any other amount you have paid. If the puppy is over 4 weeks of age you are asked to mail us a US postal money order purchased at the US post office or paypal payment, please no personal checks at this time. If we are shipping the puppy to you, we will ask you send the remaining balance of the puppy money and the shipping money to us one week prior to ship date to ensure it is here in time as we have to pay the shippers when they leave us. If you are picking up the puppy, we ask you either bring CASH or US POSTAL money order at pickup time, for the balance of the puppy money. No checks are accepted at this time. All mailed payments need to be sent with the US Postal service, or Puralator in Canada...signature conformation requested. That is a safety for both you and us. when you contact us we will give you the rest of the mailing address. Please call us before 9:pm central standard time. Thanks. The Miniature Pinscher in the picture is my Sunshine and my one of my best friends. She came from the Traylers, in Missouri. She is one of my very special girls! 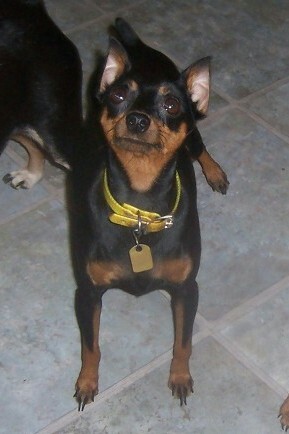 Click on her picture to see Min Pin puppies for sale.